Over the past week volunteers from the Fraser Island Defenders Organisation have worked to establish a new Nature Walk in the middle of Eurong to help people appreciate some of Fraser Island’s outstanding natural values. The 450 metre long walk that traces the path of a former sandblow was the brainchild of FIDO’s John Sinclair, who says that over the last 40 years he has watched the small sandblow become colonised by vegetation and wanted to explain the process. “Eurong is the most visited site on Fraser Island and it is appropriate to have some interpretation of the landscape and environment here where more people stop than at Eli Creek, Central Station or Lake McKenzie (Boorangoora),” Sinclair said. He added that the this walk that takes 10 to 20 minutes was very safe for children because it was inside the dingo fence that surrounds Eurong Village. ”It is a happy coincidence that the area described is so-well located between the Eurong Resort and the Eurong’s residential valley and in an area I have been observing since my parents built their house in Eurong in 1965,” John Sinclair said. John Sinclair said that a special feature of the walk will be showing how Melaleucas can survive being buried by 15 metres of sand and still survive as is shown by some melaleucas that were then exhumed by the wind that are many hundreds and possible thousands of years old. The nature walk is only one of four projects the nine volunteers worked on during week. They also added capacity to the QPWS plant nursery at Eurong, worked on more landscaping around the Eurong Resort, the residential area and worked to eliminate weeds. Mr Sinclair praised the support and cooperation of the Eurong Resort and the assistance of the President of the Fraser Island Association, David Anderson. Amongst the 9 volunteers was a retired American landscape architect who designed trails in several National Parks from the Rockies to the Golden Gate. Since 2011 FIDO with financial support from the Burnett Mary Regional Group has been carrying out three working bees a year in Eurong which have made a very significant impact on the weeds and Improved the presentation of this major hub on Fraser Island. 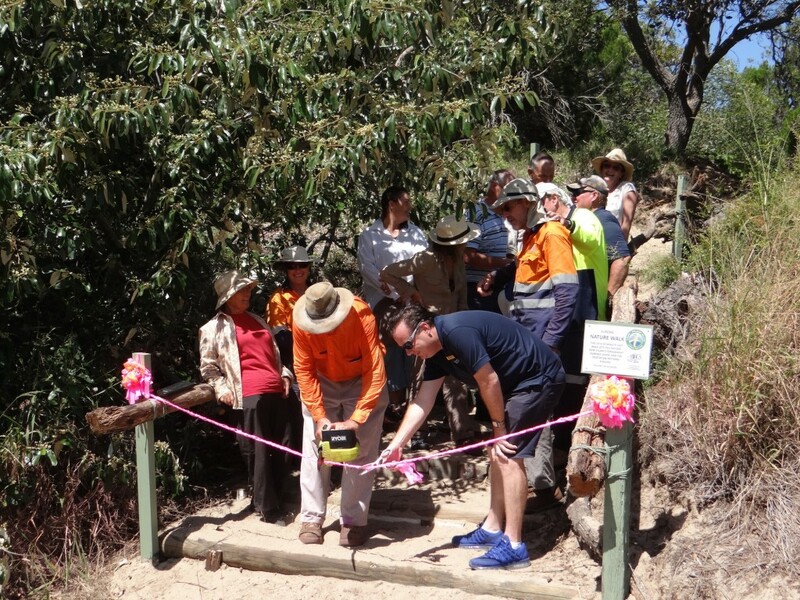 John Sinclair FIDO CEO (with a chain saw) and David Farrelly Manager of Eurong Resort (with scissors) open Eurong’s new Nature Walk between the two valleys to enable K’Gari visitors get better understanding of the soils and vegetation processes on the world’s greatest sand island. Educational, Flora, Geomorphology, History, Impacts, News, Sustainable Visitation, World Heritage. permalink.